J. Comp. Chem 2017, 38, 629-638. The force field conversion from one MD program to another one is exhausting and error-prone. 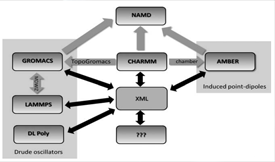 Although single conversion tools from one MD program to another exist not every combination and both directions of conversion are available for the favorite MD programs AMBER, CHARMM, DL-POLY, GROMACS, and LAMMPS. We present here a general tool for the force field conversion on the basis of an XML document. The force field is converted to and from this XML structure facilitating the implementation of new MD programs for the conversion. Furthermore, the XML structure is human readable and can be manipulated before continuing the conversion. We report, as testcases, the conversions of topologies for acetonitrile, dimethylformamide, and 1-ethyl-3-methylimidazolium trifluoromethanesulfonate comprising also Urey–Bradley and Ryckaert– Bellemans potentials.